Suggested citation: Hammond, C., Withington, C., Sharp, J., Mobley, C., Drew, S. F., Stringfield, N. S., … Griffith, C. (2014). Programs of study as a state policy mandate: A longitudinal study of the South Carolina Personal Pathways to Success Initiative (Unabridged Final Technical Report Years 1-5, Executive Summary and Implications of Findings). Suggested citation: Hammond, C., Withington, C., Sharp, J., Mobley, C., Drew, S. F., Stringfield, N. S., … Griffith, C. (2014). 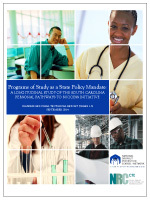 Programs of study as a state policy mandate: A longitudinal study of the South Carolina Personal Pathways to Success Initiative (Unabridged Final Technical Report Years 1-5).